Anyone ever have this issue where your Odometer shows you're low on gas but you still have a good amount left? Or am I just seeing this wrong? Usually the gas light comes on the I'm a lot lower on the gauge. I have seen it randomly fluctuate at times as well indicating the tank was almost empty when it really wasn't. Mine has done that many times, perfectly normal. Anywhere between 4-5 bars or less and the light comes on. That is common on most cars. Tanks are not evenly shaped and one end of the range appears larger than the other. The other reason is that E is not typically empty and there is some reserve left past that, so the bottom half will seem to go faster per the gauge. The Odometer shows the total distance your vehicle has been driven in miles and kilometers. It indicates 84,069 miles in the photo and will continue to increase as you drive. The Fuel Gauge "shows how much fuel you have. It may show slightly more or less than the actual amount." according to my owners manual. 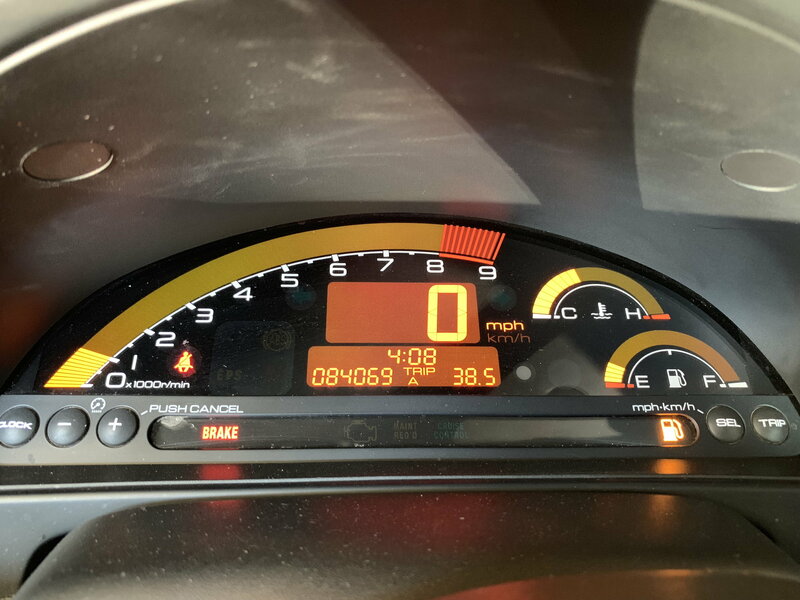 In addition the S2000 owners manual notes The Low Fuel Indicator "comes on as a reminder that you must refuel soon. When the indicator comes on, there is about 2.22 US gal (8.4 L) of fuel remaining in the tank before the reading reaches E. There is a small reserve of fuel remaining in the tank when the reading does reach E."
As noted the shape of the fuel tank and the radial motion of the fuel gauge float makes the Fuel Gauge an approximation. When the light comes on there's about 60 miles of fuel remaining if you're getting 25mpg. Right. I agree. My driveway is sloped too so my gauge will read a little lower on start-up and will later even out. There are a lot of tanks read the same way some cars but this tank being so small, exhibits these behaviors more noticeably. I have this habit I got into, a long time ago. Resetting the mileage trip odometer every time I fill up. That way I know after 250 miles or so... it's time to think about filling up. I used to have some older German cars (back in HS and college days) I restored (VWs and BMWs) --- that had a nasty habit of having their sending unit hang up. Ran outta gas a couple of times, with gauge showing 1/3rd full. I routinely reset the trip odometer every fuel stop as well. This goes back to a very old VW beetle long, long ago that did not have a fuel gauge. Factory never fitted one. When the car ran out of fuel there was a lever on the firewall to activate a reserve tank. THANKS EVERYONE FOR THE HEADS UP. I thought it was just me I was a little worried. Rarely ever see my Fuel Gauge Empty.